Roofing is the application of the finish materials that seals your roof from water penetration. 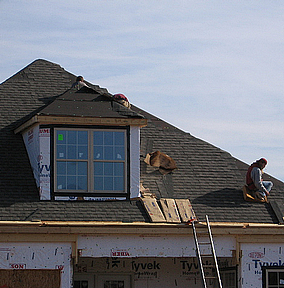 You should hire a contractor who specializes in roofing and is licensed as a roofer. You will have plumbing vents and possibly exhaust vents through the roof. Shingles should be installed after vents are in place and chimneys built. Chimneys require flashing and vents require special flanges to prevent leaks. Only a skilled roofing contractor should be trusted with these tasks. 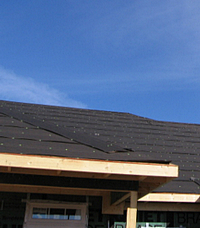 Conventional shingles are asphalt-based and come with either cellulose or fiberglass backing. Cellulose types are used primarily in colder climates because they offer greater cold weather flexibility. Fiberglass shingles are the most common choice in other areas, offering a better fire rating. Nice, Great topic, I appreciate your work..